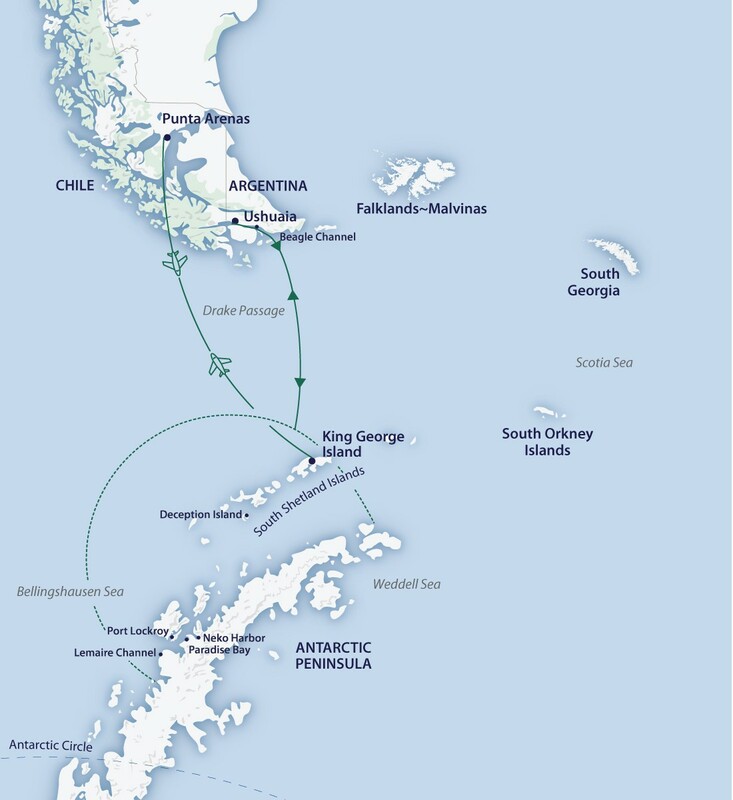 Please note: your voyage rates include charter flight from Punta Arenas to King George Island (or vice versa). Some departures are 11 days long. Arrive in Punta Arenas and transfer to your downtown hotel to check in. The rest of the day is at your leisure before a group briefing about tomorrow’s flight. The next day we transfer to Punta Arenas airport for our charter flight to King George Island. Please remember that we are flying to in very remote areas and flight schedules are dependent on weather, both in Punta Arenas & King George Island. The Antarctic Peninsula’s western flanks offer long days and relatively ice-free waters. We visit historic huts and Zodiac cruise through narrow straits and majestic icebergs, and if we’re lucky, whale watch from the bow of the ship. A few landing points we hope to visit include Half Moon Bay, Lemaire Channel, Hydrurga Rocks and more. We hope to visit the large Adélie and gentoo penguin colonies of Brown Bluff or Paulet Island, and fossil-rich Seymour Island. We may hike to spectacular vantage points on Beak or Devil Islands; large tabular icebergs and volcanic scenery create long lasting memories. Wherever we go, wildlife, Heroic Age relics and haunting landscapes await.